Tara the Hero Cat, who saved 4-year-old Jeremy Triantafilo from a neighborhood dog in California, threw out the ceremonial first pitch at a minor league baseball game Tuesday. 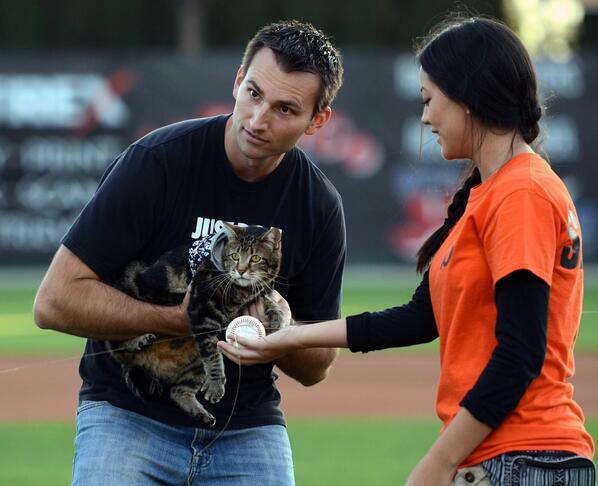 Tara was held by owner Roger Triantafilo as a baseball tied to a fishing line was pulled toward home plate at a game of the Bakersfield Blaze, an affiliate of the Cincinnati Reds. The cat became an Internet sensation last week after surveillance video of her rushing a dog that was mauling the boy went viral. Jeremy Triantafilo, Roger’s son, was playing in his family’s driveway in Bakersfield, California, when the K-9 ran up and grabbed his leg. Jeremy Triantafilo received 10 stitches for two lacerations to his calf. The dog was quarantined and will reportedly be euthanized.